Artificial Intelligence (AI) is no more a futuristic thing to be found in the parlance of data scientists alone. What used to exist in sci-fi movies has started making its way into the consumers’ lives. Interestingly, despite being in infancy, it has permeated so much that people often fail to recognize its presence, even though they live and sleep with it. For instance, while voice-ordering a pizza on Android/iOS Dominos app), you would hardly bother about the very existence of its AI-enabled voice assistant Dom. Within the first few weeks of its launch, Dom became its key business driver by securing 18% (500,000 orders) of all the orders made in the US. Emergence, evolution, and adoption of Siri, Google Assistant, Alexa, Microsoft Cortana speaks a volume about the popularity of AI-enabled virtual assistance. Respective technology companies are investing massively in having an edge in the competitive market. As of now, with 34% user-base Siri tops the popularity list. 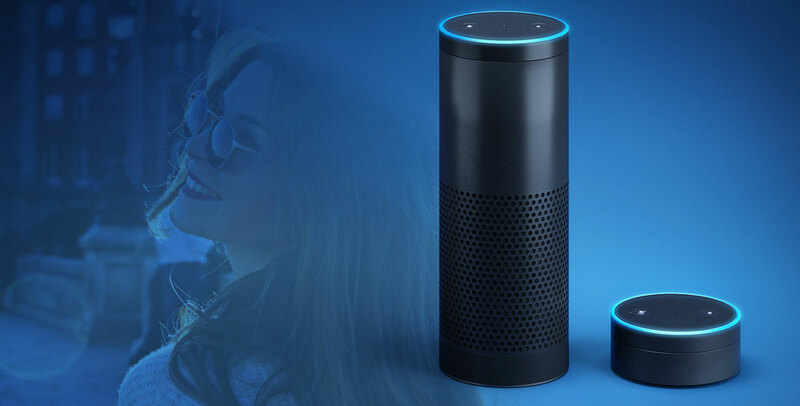 However, it’s likely to get a tough challenge from Amazon’s Alexa. Amazon is on an investment spree to woo technology companies, developers, and university students. 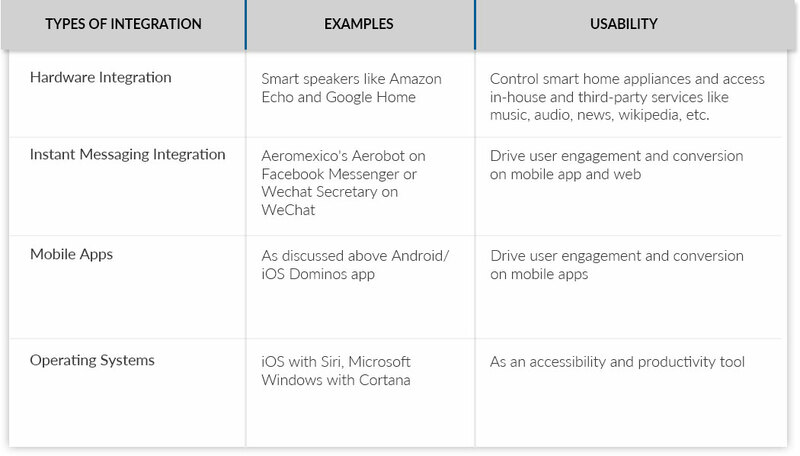 This competition-driven innovation is making AI-based voice user experience to cement its position firmly by fostering a conversational culture. See what services, devices or platforms can be integrated with this. Considering that each hardware, instant messaging service, mobile app, website or operating system is meant to perform certain pre-defined tasks, the attributes or skills of the corresponding voice has to be designed and coded very intelligently so that users can interact with their product/service coherently and get the expected job done coherently and effortlessly. So here comes the role of your technology partner. An IDC report estimates the AI market is to grow from $8 billion in 2016 to more than $47 billion in 2020. So let’s take a sneak peek as what is making them to adopt this conversational derivative of artificial intelligence. In the very beginning, we discussed how Dom helped Dominos to drive its sales and marketing endeavor by innovating the digital platform. The innovation takes the hassles out of using keyboard or keypad, that often results in typos while booking an order. JP Morgan applauded the step, calling Domino's "A technology company disguised as a marketing company disguised as a pizza company". Even if you are a small business owner or a startup, the adoption of the intelligent virtual assistant should not deter you. As there is a good deal of ready-to-use voice skills available with leading app stores like iOS App Store, Google Play, Amazon App Store, etc. So all you need to do is to find the right technology expert who can make your app or website compatible with it. Interactive voice response (VR) is something we are quite familiar with. Fusing IVR with AI, you can make your virtual assistant or customer support work more like a human. In addition, the privacy concern of customers is handled more diligently with IVR. Remember, phone banking over IVR. Anyone raising a doubt about its care should take a look at their contribution to the healthcare sector. The digital assistants are playing a key role not just in responding to the queries of patients and their caretakers, but also providing assistance to the patients post-discharge in keeping up with the prescriptions recommended by doctors for a speedy recovery. So providing a quick and rational support in line with the demands of the customers, patients, or users, make a difference to the end user’s experience. And this is a remedy that comes with multi-dimensional benefits: more repeat business and more referral customers. It doesn’t require any argument as the efficiency of an individual or workforce can’t be compared to that of a machine. The automation of business processes like sales, marketing and customer service with voice assistant is helping businesses to cut down their operating cost significantly and outpace the competition. Imagine, your 50-strong team of customer service executives getting replaced by a virtual voice assistant. Harnessing the capabilities of voice assistant, you contribute indirectly towards sustainability as you get things done comparatively with lesser or fewer resource. Concerned about decision-making? You shouldn’t as every interaction happening with your smart business system gets recorded with the help of an integrated analytics tool. Want to stay ahead of the competition with Artificial Intelligence? Don’t make a delay. Around 38% of enterprises are already using AI, records Gil Press, a Forbes contributor. We are here to help you with. Write to us at: info[at]rootinfosol.com. We can build, deploy and integrate the right voice assistant as per your requirement.